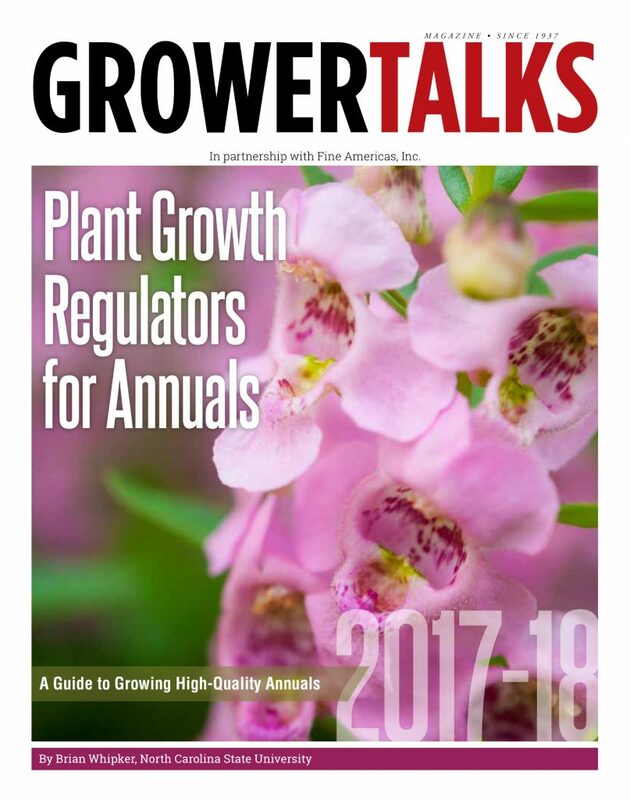 The 2017-2018 Plant Growth Regulators for Annuals guide was recently published by Fine Americas and GrowerTalks magazine. This guide is updated every two years on the odd numbered years, in rotation with the Plant Growth Regulators for Perennials guide that appears in the even numbered years. The guide is available as a free download from the Fine Americas website. The new PGR for Annuals guide is 52 pages in length and contains rate tables and PGR related articles. For larger operations that re-circulate irrigation water, paclobutrazol residual can control growth of non-target species. To counteract this, the results of a study conducted at North Carolina State University highlights how Fresco foliar sprays can be used (page 3). Due to slow growth or excessive PGR applications, plant growth can stall. Fresco can also be used to enhance plant growth. Methods of application and use tips are provided on page 5 of the guide. Paclobutrazol is the most widely used PGR in floriculture production. Because of its non-settling formulation that is super concentrated, Piccolo 10XC continues to increase in use by the industry. Use tips for Piccolo 10XC start on page 6. An overview of the available PGRs to the U.S. floriculture industry is highlighted starting on page 8. It includes an attribute comparison table. PGRs provide more advantages than just controlling excessive growth. They also enhance green leaf color, improve the water use efficiency, and offer disease suppression. Details of these other attributes are discussed on page 12. The rate table is the primary component of the guide. It starts on page 14 and continues through page 48. The table includes rates from what is listed on each PGR label, results from research conducted at North Carolina State University, and plant breeder recommendations. It is the most comprehensive PGR rate table available to the industry. The final two section of the guide include highlights for use of Collate and a Dilution Table. Hopefully you will find the guide to be use for growing high-quality annuals.